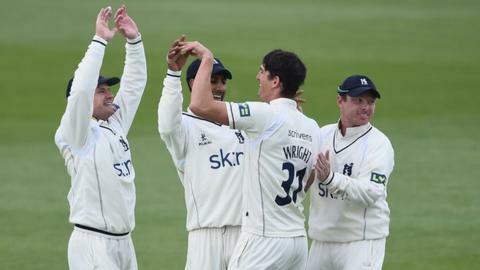 Warwickshire wrapped up their first County Championship win of the season on the third morning at Trent Bridge. Resuming on 126-3, chasing a target of 300, Notts quickly lost nightwatchman Luke Fletcher to paceman Chris Wright. After a 29-run stand between Samit Patel and James Taylor, Wright then struck twice more as the home side lost three wickets in five balls. Wright took 4-70, well backed by fellow seamers Keith Barker and Chris Woakes, as Notts were bowled out for 201. Dougie Brown's Warwickshire are now unbeaten in their last six Championship away matches (three wins, three draws), since losing to eventual county champions Durham at Chester-le-Street last June. Barker claimed the key wicket of Patel, caught at second slip, while Woakes nipped in at the end with two wickets, to add to his first innings haul of 3-13, as the Bears wrapped up the match with five sessions to spare. But it was his England Lions team-mate Wright who played the starring role, finding his form again after last summer's back injury to end up with seven wickets in the match, including the key wicket of Phil Jaques on Monday evening. Australian Test fast bowler Peter Siddle hit four boundaries in an unbeaten 28, but it was not enough to prevent the Bears, county champions in 2012, catapulting up the Division One table above Notts, who started this game in third. A three-man England and Wales Cricket Board pitch panel convened at the ground after the game to discuss the 33 wickets that fell on the first two days of the match - but although they marked the pitch 'below average', they decided that no penalty should be imposed. Warwickshire are back in action on Sunday, at home to Middlesex, but expect to be without England's Ian Bell, who has been standing in as skipper in place of the injured Jim Troughton, and Ireland's William Porterfield. "It was a bit close for comfort in the end, but a good win all the same. "Michael Lumb and Phil Jaques played very well on Monday evening. We'd have been happy to get one of them out, so to get both was important. "It was a helpful wicket. All our bowlers enjoyed the extra movement throughout the game." "We've had three unbelievable games, really, at the start of the season. We could have won against Sussex and should have won against Lancashire. You're obviously desperate to get that first win, so it's nice to get it here at Trent Bridge, against a good side. "In this division, it's about creating momentum and it's really good to see our bowlers now starting to really hit their straps. "They set such high standards, they probably didn't feel they were quite there against Sussex. There were some really good signs at Old Trafford and then in this game they've been outstanding. We've got a fantastic attack." "Searching for positives after a defeat inside seven sessions of a 12-session contest is always difficult, particularly as Notts are usually at their strongest in early-season conditions. "As in the previous match, the first innings was crucial. Warwickshire scored too many, Notts too few. "But a five-wicket haul for Andy Carter, runs for Phil Jaques and some inspired bowling from Peter Siddle at least gave home supporters some cause for optimism. "Two defeats out of three, for a side as strong (on paper) as Notts represents a fairly wretched start to the campaign but there's enough quality in the squad to bounce back quickly." "Warwickshire feel that they should have won both their first two Championship matches so it was a relief for them to have seen this one through to a successful conclusion. "Pace bowler Chris Wright produced another stirring performance in the morning session and, although conditions at Trent Bridge were undoubtedly helpful to him, his efforts in the early part of the season suggest he has fully recovered after a long injury lay-off and is back to the sort of form that helped Warwickshire win the title in 2012. "His cause was helped by a great improvement in the team's catching, stand-in skipper Ian Bell holding five in the match at third slip, while William Porterfield took two excellent ones near the end at second slip. "One cause for concern is that Bell and Porterfield are the only two batsmen looking in good nick so far and both are likely to be missing for the home match against Middlesex due to international call-ups."